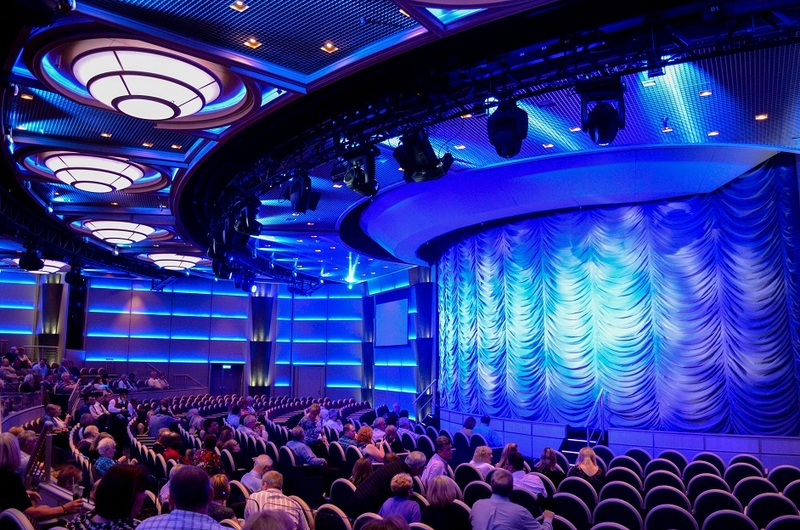 For anyone interested in cruising, the announcement of a new cruise ship is certain to be an exciting thing. 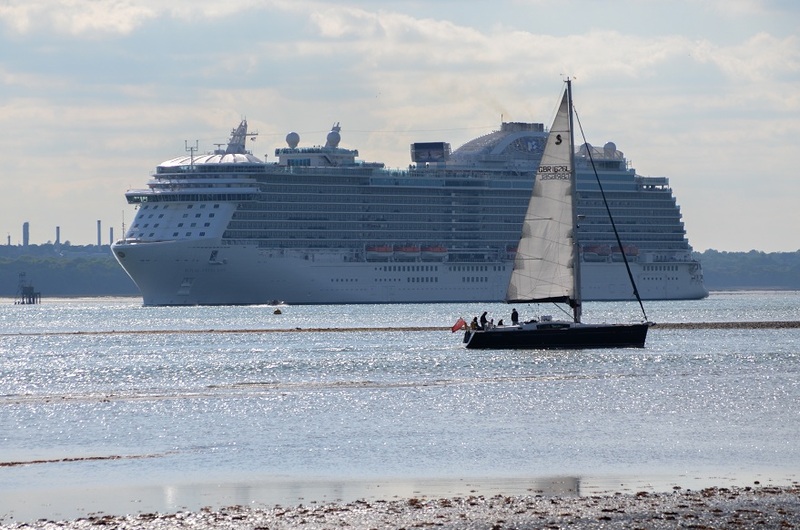 For a certified ship spotting cruise enthusiast, like myself, it is something else – especially when you learn that the new ship in question will be visiting your home port and that you’re going on it for a preview cruise! Having made a very early morning, 180 mile road trip to be back home from work in time to see her sailing up Southampton water for the first time, I proudly gloated to fellow ship spotters standing in the pouring rain on Town Quay that I’d be on her in a few short days. When the day arrived I packed the smallest of suitcases and set off to Southampton way ahead of the suggested check-in time, which is usual practice for me. I’m lucky enough to live near the port and the average time on all my cruises so far from front door to having an overloaded plate in front of me in the buffet restaurant is around 45 minutes. It seemed that everyone else had turned up early too, eager to get on board and the Ocean Terminal was heaving by the time I arrived shortly after 11 AM. 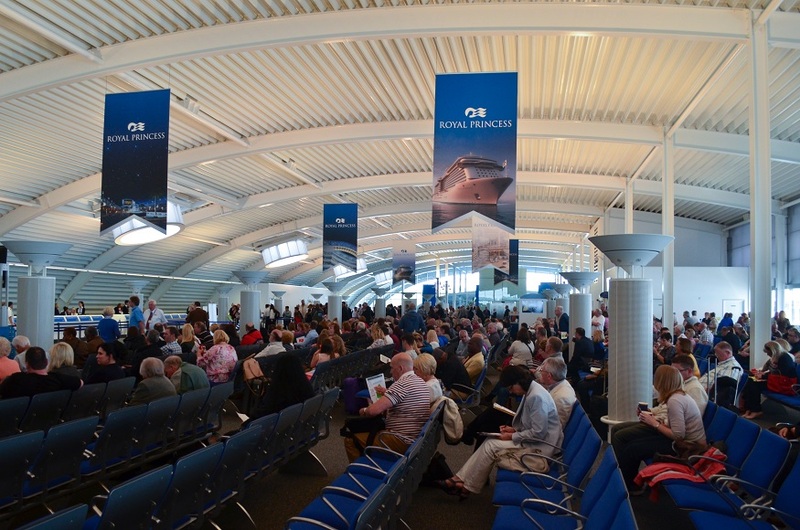 The terminal was decked out in Princess Cruises colours and Royal Princess banners adorned the departure lounge. Towering over the quayside and filling the floor to ceiling windows stood Royal Princess in all her glory. It seemed that the early influx of eager passengers had caught the port staff by surprise and on this occasion it was a full 2 hours before I was tucking into my lunch in the Horizon Court. It hadn’t mattered too much, the departure lounge was a comfortable place to be and the surprise arrival of two friends who were also going on the cruise with us, helped pass the time. In fact, the delay just seemed to add to the anticipation. Stepping onto the ship it was immediately clear that she was very elegant, as all the pictures and videos I’d poured over for months had indicated. Every surface glistened and the smell of new carpets wafted throughout. The staff all appeared very smiley and seemed proud of their shiny new ship. One advantage of getting on board a little later was that our cabin was already available, so we headed straight there to take a look and drop our bags off before lunch. The cabin was a Deluxe Balcony Cabin on E deck, E325 to be precise. The cabin was of average size and adequately kitted out. Although new and shiny, the furniture had a familiar look and feel. It was very similar in design and style to that found on P&O’s Ventura. I was impressed by the huge flat screen TV on the wall. It had great on demand options (mostly American TV) but there were few other features. For example, there was no way of checking your account, ordering room service or viewing your on board photos as we’d recently experienced on another ship. I think someone also forgot to switch on the navigation information channel as the ship seemed to be permanently stuck just off the Isle of Wight! The bathroom was on the small side compared to other ships I’ve experienced and provided little in the way of storage. The shower had a curtain and the pressure from the detachable head was barely a trickle, which made it difficult for my wife to wash her long hair. This was exacerbated by the asthmatic hair dryer that could barely muster a puff of warm air! The balcony was compact and was barely any deeper than the length of the two chairs on it. 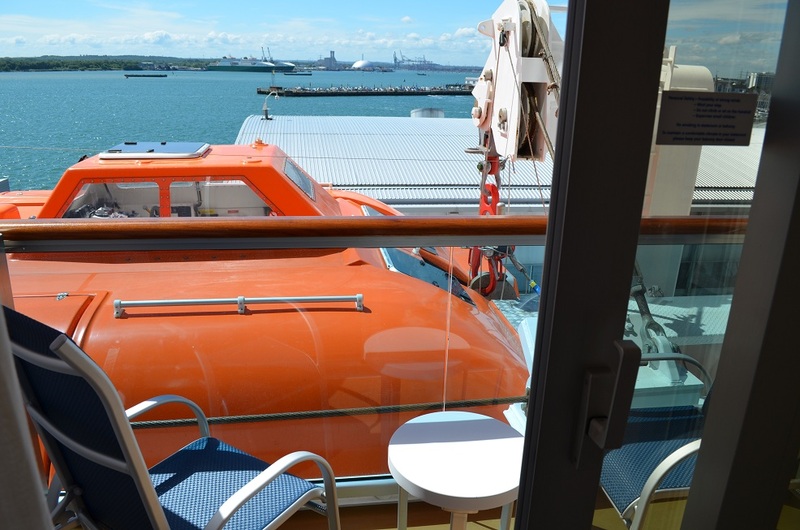 It was advertised as having an obstructed view and so the lifeboat hanging inches from us was no surprise. It wasn’t possible to see the sea below but it did at least offer a private outside space for occasional sitting and relaxing. On a longer cruise I think some of these things may have irked me a little, but for two nights it was fine. 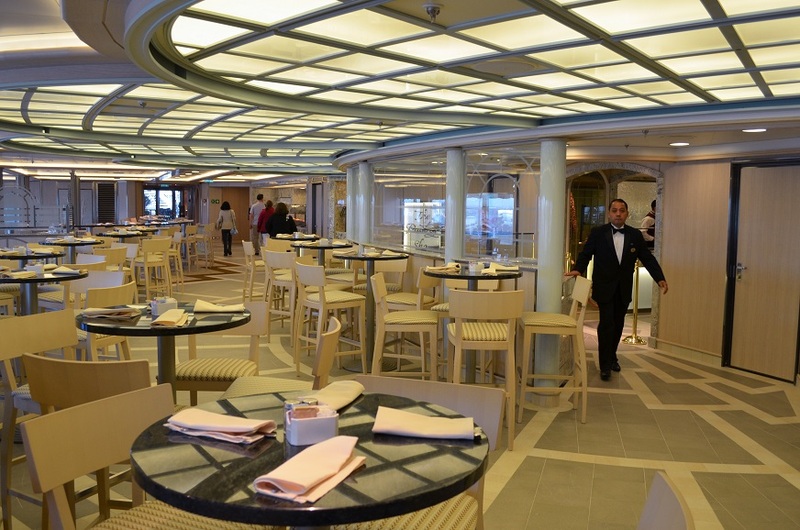 The Horizon Court buffet restaurant was one of the best laid out I have seen. It was a good size and was sensibly organised with large serving stations running through the middle, side to side like corridors. The decor was quite sophisticated and it felt more like a restaurant than a buffet. There was a good selection to choose from at lunch but a very limited choice in the evening. Overall though, the food quality was good. The much touted Pastry Shop had some great puddings but didn’t seem to have any savoury pastry and in reality was just a very nicely presented dessert station. After lunch it was time to start exploring and take in the rarity of a sunny afternoon in Southampton on the upper decks. The main pool deck seemed enormous. It was very open and was an impressive space. 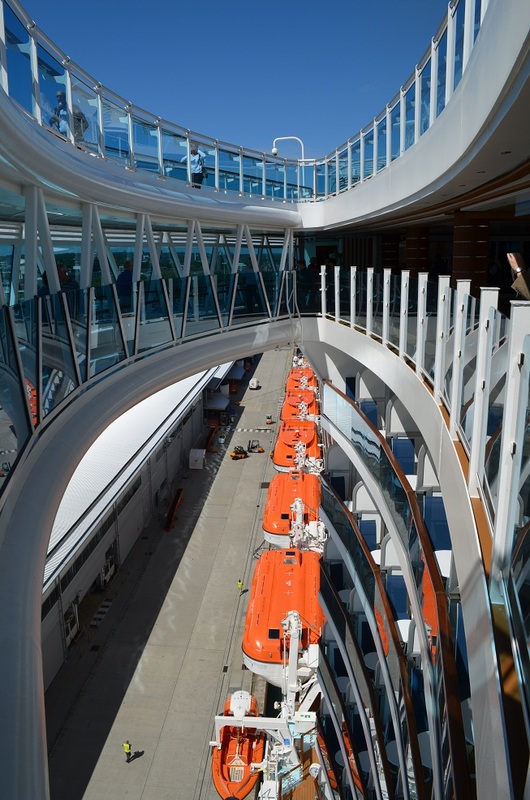 With the Seawalk bulging out 30 ft over the side of the ship one side and the Skylight bar doing the same on the other, the width across the widest point of the ship was quite impressive. The Seawalk itself was interesting and certainly a unique experience looking down through the glass pavement to the decks and sea below. Some people didn’t quite embrace it and shuffled around the side groaning as they did so muttering things along the lines of “I’m never doing that again”. I guess it is not for vertigo sufferers, but if you go on Royal Princess it’s one of those things that has to be done at least once. However, beyond that it is just a novelty walkway and doesn’t have a lot of repeat appeal. On the other side is the Skylight bar. It’s a similar space but instead of having a gaping hole through the middle, it has a bar and a few seats. It is open to the elements and would be a nice place to sit for a cocktail or two on a sultry Caribbean evening. Beyond the pool deck was the Sanctuary. An elegant luxury space full of plush cabanas and sun loungers where you could hire your own little piece of serenity for anything from $15 for half a day on a lounger, to $130 for a whole day in a private cabana. 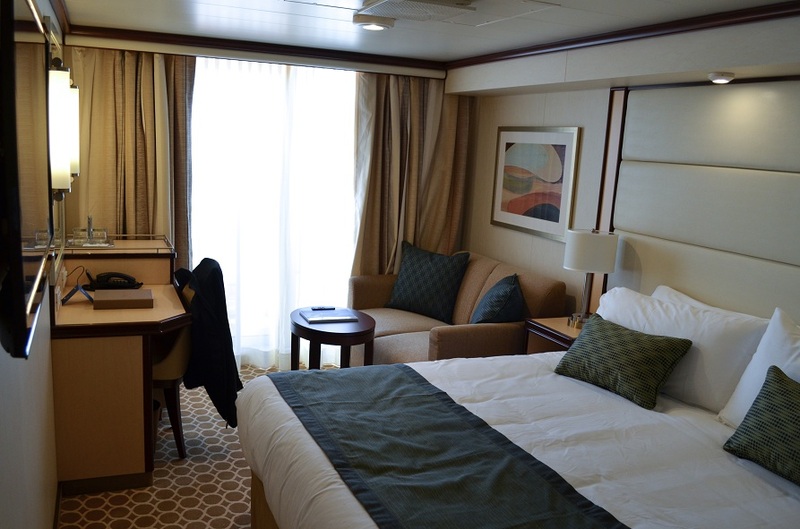 It was a lovely area and the only place where you can get to the front of the ship with a relaxing view out over the ocean, but personally I find this kind of premium facility a little elitist and I begrudge paying the charges. In between the pool deck and the gates keeping the riff-raff out of the Sanctuary, there lays the Retreat Pool and bar. Not quite as luxurious as the Sanctuary itself, but still a very nice secluded area with comfortable beds and a nice pool which was open to everyone. Following a lovely sail away and yet more exploring, it was time to get ready for the one and only formal night. After a couple of pre-dinner photos we headed to the main restaurant for our late sitting. We were surprised to find a queue to get into the restaurant but this soon cleared and we found ourselves inside a smart, modern, inviting space. There wasn’t the wow factor that some ships have but it was stylish and quite sophisticated. Unfortunately the dining experience itself was lacking somewhat with slow service and very average food that wasn’t quite as advertised on the menu. These were probably just teething troubles, so I’ll leave it at that. Due to the fact we were on a late sitting and had spent the earlier part of the evening taking in the sail away and getting ready, we hadn’t gone to the early show. We only finished our main course at 10:00 and despite abandoning dessert and coffee, we still couldn’t get a seat in the 10:15 production show. It was a shame, but we didn’t let it spoil a good day and settled down in a bar for a few drinks, soaked up the atmosphere and enjoyed the piano entertainer instead. We looked forward to day 2 where we would be anchored off St Peter’s Port, Guernsey……..